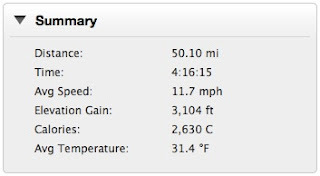 Okay, it's not huge compared to the last milestone, but it is my first ride over 50 miles. It was pretty epic given that it was very near freezing (I think the temperature gauge is off on the Garmin by a little and it wasn't quite as cold as it said). This one went a lot better in terms of my friendliness with the saddle. In that 48 mile ride I really couldn't have gone another minute or two. In this one, I was still doing okay, though I'm not sure I would have made five hours. But that said, I rode all of this with my front suspension locked out (and thus doing nothing). In the 48 mile ride, I only did about an hour of it that way. Mentally, it was certainly nice having company on this ride. 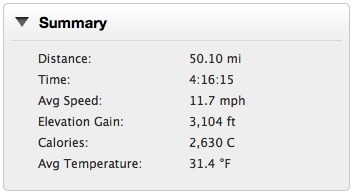 That 48 mile ride was completely solo. It's also better when it's not misting on you for large chunks of the ride, but it was really only enough to make having glasses on annoying. Anyway, it was a fun ride. The first thirty minutes are always the hardest, but once I get that first Honey Stinger waffle in me, well, I perk up! Although by the time we finished today those things were getting so cold they were really hard to chew!